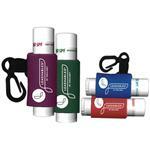 SPF 15 custom lip balm in full color with a clip on cap - great for conferences and trade shows. Add color to any promotion with a lip-smacking, tropical-flavored lip balm that has SPF 15 protection! Complete with UVA / UVB, Aloe Vera and vitamin E, this PABA-free balm multitasks by moisturizing lips while preventing burning and chapping. 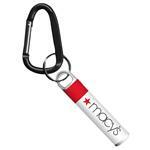 Great as a lanyard clip on attachment. Made in the USA! Available Colors: Full Color Imprint. White Tube. Typical Imprint Area(s): 1.75" x 1.375". 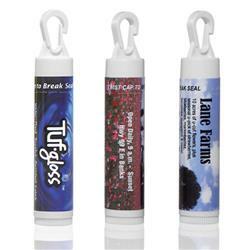 Customizable with a four-color-process, scratch resistant, waterproof Tuf Gloss™ label, this is an ideal giveaway for tradeshows & corporate retreats. Made in USA Lip Balm.